Many restaurants in Kauai offer wonderful ocean views. 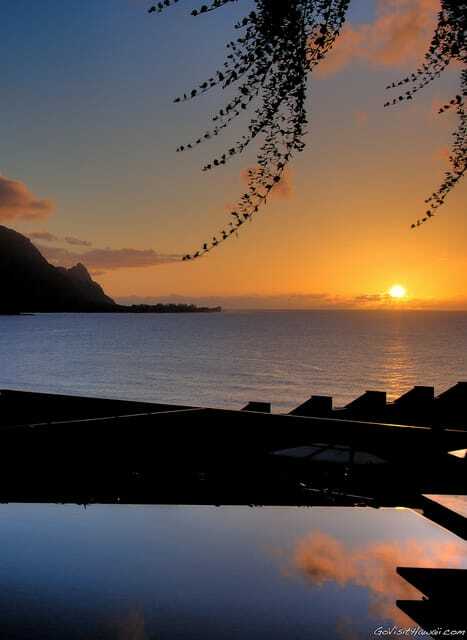 This photo was taken at Makana Terrace from our table while dining at St. Regis Princeville. You’re going to Kauai and you’ve reserved your hotel and now you’re trying to pick out some good restaurants for your vacation. So, where do you start? Where are Kauai’s best restaurants? How do you make your selections? Let me help take some of the pressure off you by providing you with some great Kauai restaurant resources. We spend a lot of time researching the restaurants we choose for our own Kauai vacation. We read tons of reviews. Where possible, we like to find restaurants with ocean or other special Kauai views. We also focus our attention on restaurants that serve Hawaii regional cuisine. We can get great Italian or Mexican fare at home on the mainland, but we can’t get Hawaii regional cuisine. That’s why our recommendations are very much focused on Hawaii cuisine. If we like the restaurants where we dine, we share them on the following lists that we’ve tried to neatly organize by category. On the North Shore, Makana Terrace in Princeville at the St. Regis resort has amazing sunset views of the beautiful Bali Hai. I don’t believe there is a restaurant in Hawaii that can rival the outstanding dinner view. (See the above photo of the view we had from our table.) We’ve dined here many times and never get tired of that view. We advise making a reservation for the evening opening time, which is normally 5:30pm, or soon after to score a table with the best view. On the east side of Kauai, a romantic restaurant is the Hukilau Lanai in Kapaa. If they are offering a tasting menu, it is usually an exceptionally good value. The food is quite good with many locally sourced ingredients. Make a reservation in advance and request a table on the lanai. On the South Shore, we found the sunset views from The Beach House to be very romantic. The view is so lovely that we’ve often seen weddings taking place on the lawn beside the restaurant. Both service and food are very good here. Tidepools at the Grand Hyatt Kauai in Poipu has a little bit of ocean view, but it’s surrounded by koi-filled pools and waterfalls that provide a very romantic setting. Best sunset view restaurants with excellent Hawaii-regional cuisine are Makana Terrace (Princeville) and The Beach House (Poipu), which are both described in a bit more detail in the above list. Gaylords at Kilohana near Lihue offers fresh island-grown food served in a courtyard setting. Note that they have great happy hour specials Monday though Saturday at around 4pm to 5:30pm, which can help you stretch your vacation budget. I recommend arriving well before sunset anyway so that you can check out their lovely grounds. Plantation Gardens in Poipu offers lovely outdoor tables in a wrap-around porch surrounded by gardens. We really liked their lilikoi lemonade for a non-alcoholic beverage. Duke’s (Lihue) is an ocean front, open-air restaurant that serves good food. It’s located on the grounds of the Marriott Kauai. For dessert, we recommend sharing their delicious Hula Pie. Brennecke’s on the Beach in Poipu serves lunch and dinner in a casual, open air atmosphere with great views of Poipu Beach. In addition to their sit-down restaurant service, they also have a deli that’s great to pick up an inexpensive meal to take to the beach for picnic. We like grabbing a sandwich from here for a sunset picnic. Kalypso in Hanalei has a lively open-air setting, but no ocean views. This place tends to get mixed reviews, but we’ve had good experiences here. Kalapaki Beach Hut in Lihue has ocean views from the upstairs tables. We’ve gotten a great breakfast from there. We hear their burgers are excellent. Ono Family Restaurant in Kapa’a serves great breakfasts. We love their pancakes. If there’s a wait when you arrive, sign in on their wait list clipboard. 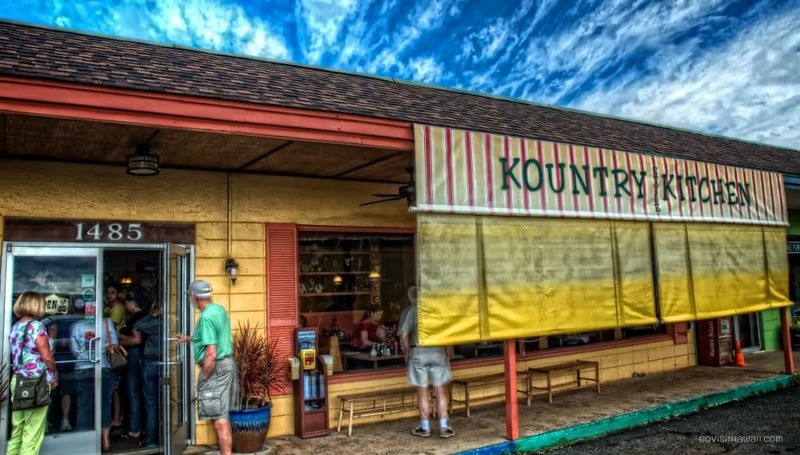 Kountry Kitchen in Kapa’a serves great breakfasts with ginormous serving sizes. Plan to take a doggie bag away with you, if you can. Chicken in a Barrel in Kapa’a is a unique barbecue place that’s popular with the locals. They literally cook/smoke their meat in a 50-gallon barrel. This restaurant will bring out your inner caveman. There are outdoor picnic tables at this food stand, however, why not take in the ocean views on the beach that’s less than a 100 yards from the food stand? Please note that if you are watching your waistline, this is not a good restaurant for you, unless you order off their kids menu. Tahiti Nui in Hanalei offers tasty dinners in a very casual atmosphere, usually with evening entertainment. A scene in the movie The Descendants was filmed at Tahiti Nui. The quirkiest restaurant with cheap eats (for Hawaii standards) would have to be the Puka Dog (Poipu). We like the puka dogs with mild garlic sauce, lilikoi mustard, but add relish on the side. Best budget friendly-restaurants — we asked a couple of local residents to list their favorite places to dine in Kauai on the cheap. To this list, I would add some of the restaurants from the above list for local grindz — Kalapaki Beach Hut, Ono Family Restaurant, Kountry Kitchen. In addition, I’d add Joe’s on the Green in Poipu. Future Go Visit Hawaii picks? We continue to keep this page updated with each visit to Kauai. In the meantime, we keep a running list of restaurants we’d like to try for next time. Here are Kauai restaurants that we’ve got our eye on. RumFire at the Sheraton Kauai in Poipu is a relatively new comer to the Garden Island. The ocean front setting looks superb. Merriman’s in Poipu is one of Peter Merriman’s restaurants, who is one of the founding fathers, so to speak, of Hawaii regional cuisine. Wahooo Seafood in Kapaa is a local favorite for seafood fine-dining. Ono Ono Shave Ice in Kapa’a is a place locals have recommended to us. We hear that the shave ice with ice cream a the bottom and sweetened condensed milk on top is a delightful sugar fest. When I first created this page, Yelp was hardly known. Now I think that Yelp is an excellent resource for finding restaurants anywhere we travel. I have faith in the wisdom of the crowds and I think Yelp and TripAdvisor are example of that. Now, I’m not naive enough to believe that every word of Yelp and TripAdvisor’s reviews are 100% accurate. From time to time, I suspect that there are some fictitious positive and negative reviews. That being said, I still feel like they are very useful resources. For Yelp, a good starting point is with this link. From there you can sort to the type of food, prices and location you want to find. I have always found the Ultimate/Revealed guides to be fairly trustworty for restaurant recommendations. The Kauai version is called The Ultimate Kauai Guidebook. Fodors.com has a free list of Kauai restaurants that you can sort for your needs. Garden Island News, the Kauai newspaper, surveys its readers for the best of Kauai in many categories, including restaurants. This list will give you more of a local’s opinion. Here is a link to Best of Kauai 2014. There are many categories including best shave ice (Jo Jo’s Shave Ice in Waimea), best plate lunch, best Filipino food, most romantic (The Beach House), etc. I sincerely hope that this comprehensive list of Kauai restaurant resources will save you time and be a big help as you select your restaurants on your Kauai vacation. We aim to keep this list updated as often as possible. We have most recently updated in March 2013. Which Kauai restaurants are your favorites? If I could combine the view of Cafe Hanalei with the food at The Beach House, I’d be a happy Kauai camper. Sitting at Cafe Hanalei and watching the many waterfalls off in the distance, combined with a great sunset, makes it very romantic. Wow! So much information. Sheila,thank you for that! Andy, that picture is gorgeous. If that doesn’t do it justice, then this is definitely a place I want to check out. I think your listing of TripAdvisor as #1 was a good one, sometimes it’s just good to get a list of names so you can do your own research. I think some areas Trip Advisor does a good job and other areas it’s a little spottier but you can always get a decent list. For the life of us we couldn’t find the Hamura Saimin Stand though… we ended up eating at Garden Island BBQ & Chinese Restaurant that night entirely by accident. Garden Island was craaaazy packed with people with coolers of beer, haha, it was quite a scene. And add another vote to Roys, we hit up the original on Oahu and the one in Poipu too. They opened up one a year ago in Baltimore, which was the first one we’d gone to, so we had to visit Roys in Hawaii! @ HR – I’m glad you find this information to be useful, because that is what it was intended to be!